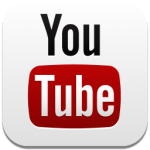 Click to watch your rug being cleaned! TRANSFORM your stained, allergen-filled, soiled and dust-worn rugs into clean, silky-soft pieces, with Surrey’s award-winning Rug Cleaning Specialists! We provide Professional Deep-Wash Cleaning and Applied Stain and Odour Treatments for all types of rugs, oriental carpets, kilims, silks, tribal bags & trappings, aubussons (French or Chinese), tapestries, decorative weavings, rare and investment pieces, as well as large and room-sized carpets. 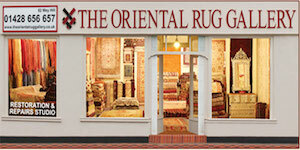 Our rug cleaning and applied treatment works and services are undertaken in The Oriental Rug Gallery Ltd's extensive custom-built Rug Cleaning Studios ~ all under one roof! Deep-wash clean and revive the lustre of your rugs, Oriental carpets, kilims and tapestries, using The Oriental Rug Gallery Ltd's Professional Deep-Wash Rug Cleaning System that cleanses, rejuvenates and conditions your weavings to last longer with great results. Specially devised by Anas – our fourth-generation Rug Specialist, Master Rug Craftsman and Rug Cleaning Expert, our unique Rug Cleaning System is a revolutionary deep washing process that produces amazing results – come and experience it for yourself! 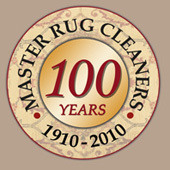 Our 10-step, rug cleaning system combines the family's eco rug-wash formulae – specifically created as non-abrasive, natural soapy solutions, with traditional hand-washing and specially devised rug cleaning equipment, and any applied stain/odour corrective treatments, to thoroughly penetrate and deep-cleanse your weavings – giving a better conditioned and more complete clean. 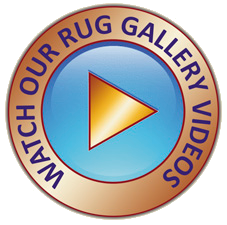 Watch our Rug Gallery Videos to see our rug cleaning in action, where more and more of our customers are enjoying the good results! Our Stain & Odour Corrective Treatment works: are specifically designed to treat and improve long-standing, deeply absorbed or saturated, stubborn stains and odours, as well as colour-run. All stained pieces brought for cleaning are assessed, where any stain/odour treatment works are discussed with the customer before we proceed. 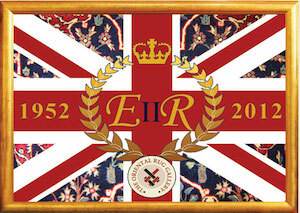 See more information below about these individually applied rug works. Whether your rug is hand-woven, machine-made or hand-tufted, traditional, contemporary or antique, The Oriental Rug Gallery Ltd's Rug Cleaning Specialists will ensure your piece is thoroughly cleaned, the colours revived and the original lustre restored! We can also arrange to help carry your rugs and carpets to and/or from your car, if you let us know in advance of your visit to the Rug Gallery. SHAKE OUT! years of Dust and Allergens that vacuuming alone cannot remove! TRANSFORM your Weavings into CONDITIONED, CLEAN, AND SILKY-SOFT pieces! REVIVE Colours! CLEANSE the Pile! RESTORE the Lustre! 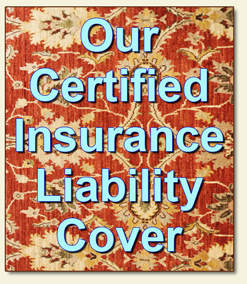 ~ for all types of rugs! We offer the BEST rug cleaning system in Surrey, London, Hampshire, West Sussex and Berskhire, where more and more of our Customers continue to enjoy the fantastic results. Due to the nature of stains, odours and some rug types, it may be necessary to undertake tester applications and individually applied stain/odour corrective treatment works for colour-run (commonly found in pieces produced with artificial or non-fixed chemical dyes), or long-standing, deeply absorbed, pre-existing or saturated, stubborn stains and odours. 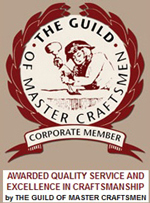 Here, stains and odours are individually assessed and reviewed by the Master Rug Craftsman, when a piece arrives at the Rug Gallery for rug cleaning. Any individually applied rug works needed are listed and costed separately from the general deep-wash rug cleaning service, on a receipt for works. Corrective Treatment Works are applied before and during the general deep-wash rug cleaning works being undertaken, where any applied treatment may mean rug works for a piece may take a little longer to be completed. We offer customers a Collection & Return Delivery Service for the cleaning of pieces, to and from The Oriental Rug Gallery Ltd. 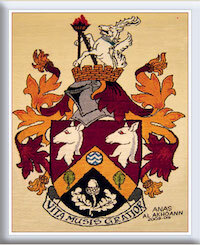 Please see our Rug Services: Collection & Delivery for more information. As usual, we offer a 15% discount to all other Retail Rug Shops, when we collect any rugs or oriental carpets for our cleaning and stain corrective treatment services from them, on their customers' behalf. "ASTOUNDING! You Oriental Rug Gallery folk have achieved the near-impossible and brought my curling antique carpet back to full technicolour! Fantastic cleaning result, it's like having a new rug!" "Never knew our rugs and aubusson tapestry could look so clean and feel so silky. We are so pleased with your cleaning results, and so quick too. They are now on display and much admired. Thank you so much, we will be back with more of our rugs for cleaning soon!